Anxiety has a way of getting the better of us in the worst ways. While many of us can and will experience symptoms of anxiety throughout our lives, 1 out of 50 people will likely develop some sort of anxiety disorder at some stage in their lives. I know what you’re thinking. That is a lot of people. One of more important roles of counselors is their ability to teach their clients self-regulation techniques and encouraging them to execute on them, which is key to healthy behavior and maintaining that behavior through emotionally challenging situations. My own experiences tend to agree with this assessment – the ability to self-reflect and identify commonalities within your most anxious moments is a powerful tool for coping with those more distressing junctures. Additionally, anxiety has a tendency to lead to depression, causing a sort of symbiosis of mental anguish that wrecks havoc with your mind. It was during one of those periods that a friend recommended an app to me, called Worry Watch. Being a young, face-glued-to-my-phone millennial, there was certainly some appeal to the app; it was like a journal, but since it was tied to my everyday device, I could get access to it easily and have it do all the anxiety-inducing things like curating and organizing. That stuff is hard to do when you can barely make it out of bed and find the motivation to feed yourself. So why not? I thought I’d give it a try. More often than not, a lot of the fears and anxieties that crawl up from the underbelly of the brain are typically irrational fears of our own making. It’s often difficult to reflect on those thoughts and consider whether or not they are rational fears, or ones that are just exaggerated. Worry Watch allows you to track these thoughts individual and organize them neatly in a way that advocates your ability to look over all of your moments. Each time you are feeling anxious about a particular thing, you name the event, give it context through the categories that you create (family, financial matters, problems at work) and decide if the outcome was as bad as you worried it would be at the time of the event. This pattern of self-reflection allows you to see the bigger picture. After several months of use, I noticed a distinct pattern of behavior on my end – most socially related anxieties never turned out as bad as I had thought they were, but many of my work anxieties had outcomes that I had expected. I never would have been able to figure that out without a tool to help me reflect on those outcomes. Generally, many agree that introspection is productive, which is distinct from compulsory rumination. Neuroscientist Dr. Daniel Siegel describes time reflecting on yourself as “time in,” a period where a person checks in with themselves to see where they are at emotionally. The problem is that often your mind isn’t necessarily a safe place, but can also be a destructive environment filled with paranoia, suspicion, and denial. So, is this going to solve all of your anxiety issues? Probably not, but I think there is something to be said about supplementing your recovery with something that helps promote positive behavior. Being aware of your experiences, learning from them, and considering new perspectives is miles more effective than rehashing old ground or “working on the problem” without a plan. 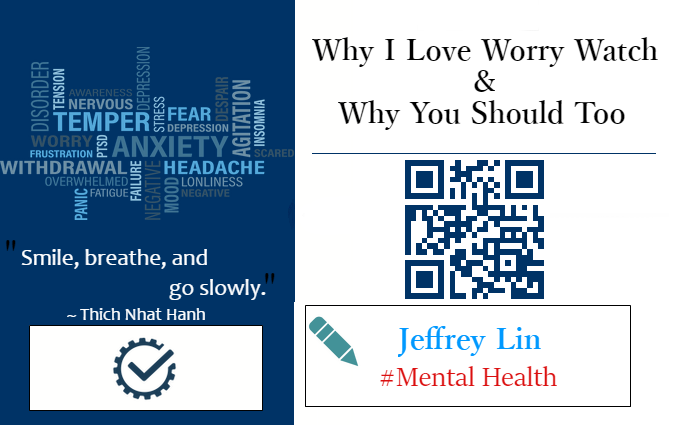 Jeffrey Lin is a freelance writer, technology enthusiast, and game developer.